We have been gearing up to unveil our next project to the public! 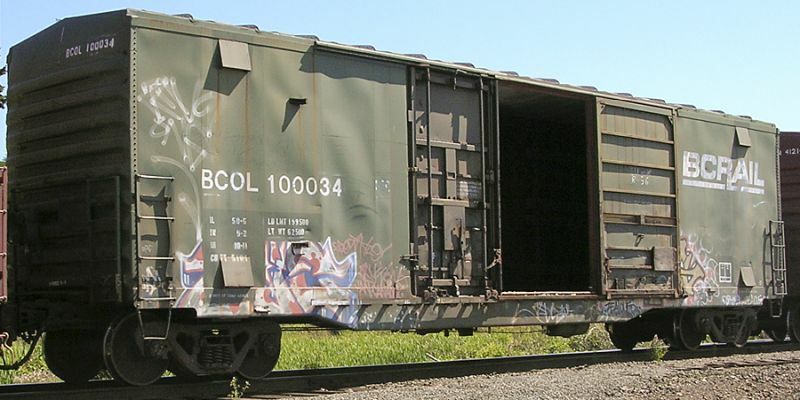 For the past year we have been canvasing our PORTERS members for interest and input on a new boxcar project – used in the forest product service. 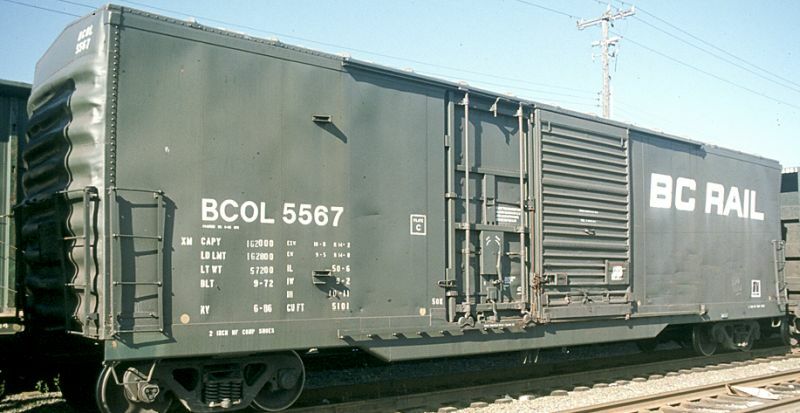 The Pacific Great Eastern / British Columbia Railway received 1,785 of these boxcars from National Steel Car between 1971 and 1973, making them the most numerous boxcar on the railway. They were seen all across Canada and the United States in forest product service. 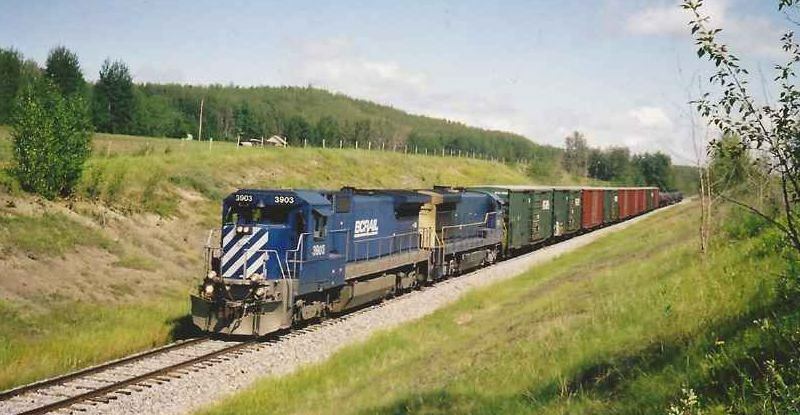 From 1989 some were re-built for pulp service and many have continued in service with CN since 2004. 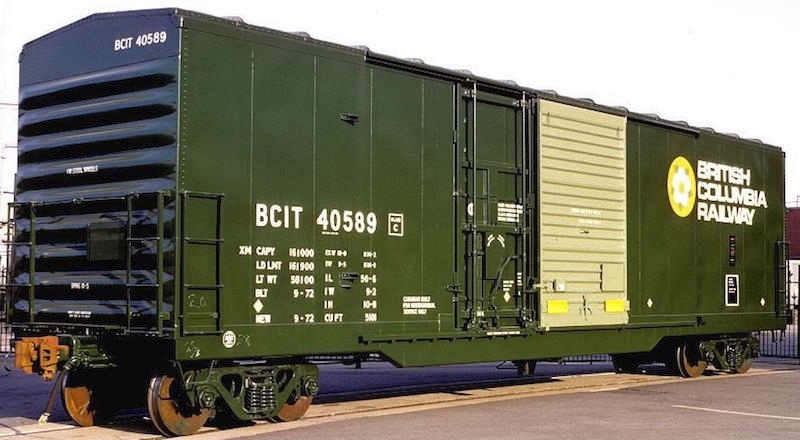 North American Railcar Corporation will produce HO & N scale models representing the cars built in 1971 and 1972, and those re-built for pulp and forest product service. 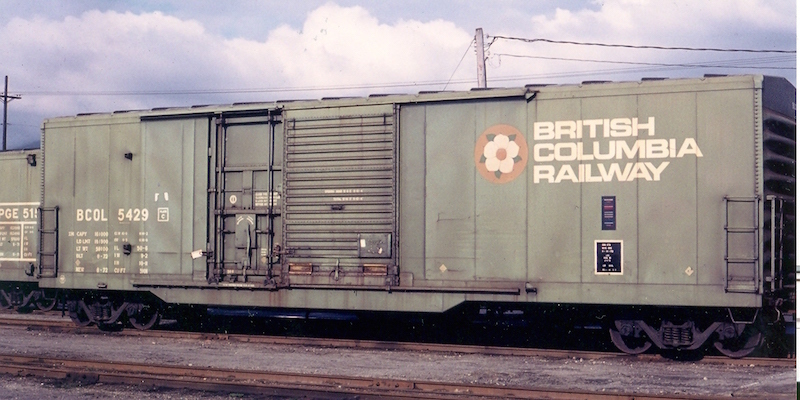 National Steel Car built 1,885 5092 and 5101 cubic-foot combination door box cars between August 1971 and May 1973 for Pacific Great Eastern and British Columbia Railway (successor to PGE). These cars were delivered with 70-ton trucks with 33-inch wheels. The PGER and BCIT “international service” reporting marks were implemented to take advantage of a then available exemption from federal sales taxes on the purchase and repair of cars dedicated to international service. Along with the PGER and BCIT reporting marks, cars also had to be stenciled “For International Service Only”. In 1975, the tax exemption was eliminated and at that time, the cars with PGER and BCIT reporting marks started receiving BCOL reporting marks. These cars were seen ALL over North America delivering British Columbia sourced forest products! While the body remained unchanged during the productions run, the ends, side sills, stirrup steps and plug door stops evolved over the production run. These features will be applied, as appropriate to each version. 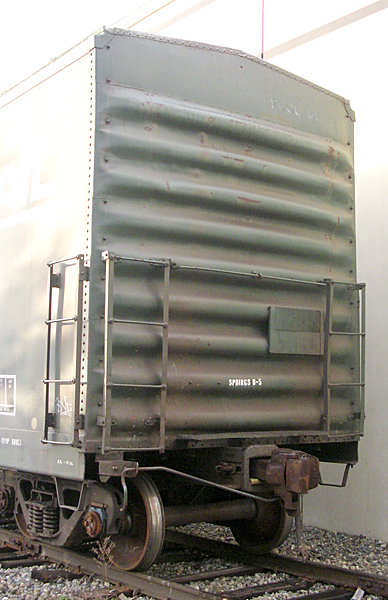 All cars were delivered with car bodies with welded panels, five panels to the left of the plug doors and seven to the right of the sliding doors and all were originally equipped with YSD 6-foot auxiliary plug doors and 8-foot YSD 6/6/6 corrugated sliding main doors with lift handles and were designed for forest products loading. All cars were delivered with riveted “bow-tie” panel roofs (licensed from Pullman Standard). Detail on the roof includes rivets along the seam caps between panels, along the ends and along the sides! On all cars as delivered, the ends are riveted to the car body. All three end styles will be available on appropriate cars, with correct reporting marks and numbers as well as accurate paint schemes! The first five orders were delivered with welded side sills that drops below the door opening and extended to the ends of the car. 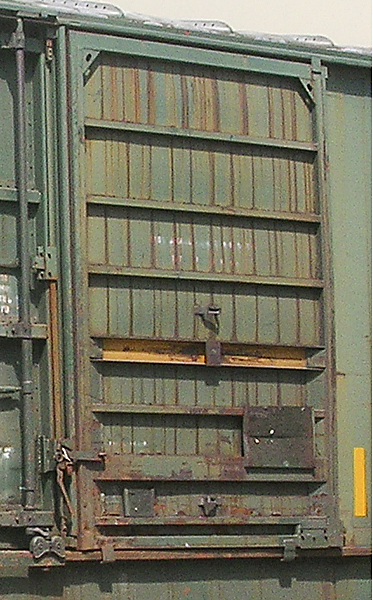 The following two orders were delivered with a similar side sill, but with a notch at the ends of the sill. Cars with both side sills are being offered, with appropriate reporting marks and series and paint schemes. We feel it is important to offer our customers cars with no details overlooked! The stirrup steps (Type 1) on the non-notched side sills are mounted to the lower edge of the side sill while the steps (Type 2) on the notched side sills are mounted behind the side sill notch, and are taller than the steps on the non-notched sills. Of course, the appropriate steps will be applied to the correct cars! 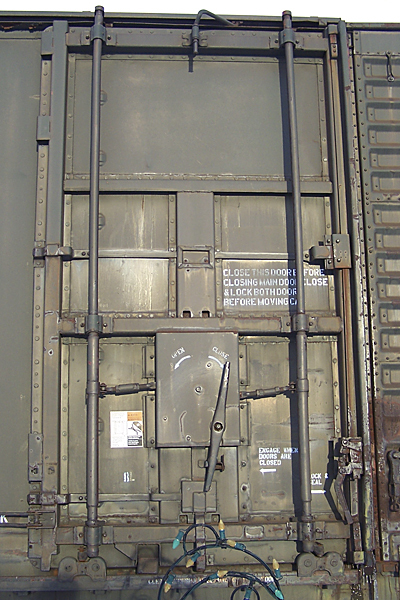 All 1,885 cars were delivered with 6-foot wide Youngstown Steel Door (YSD) auxiliary plug doors (on the left) and 8-foot wide YSD 6/6/6 corrugated doors, with lift handles. Early orders were delivered without fork pockets on either side of the lift handle, while later orders were delivered with fork pockets. Of course, we are doing both versions of the doors! 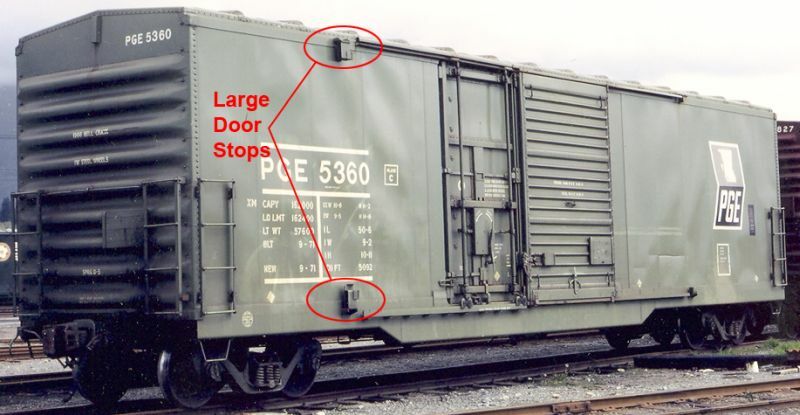 In the mid-1970s, “crank arms” were added to the top center of the plug doors to eliminate the risk of the doors accidentally falling off (this was a mandate for all plug doors, on all cars, on all railroads). 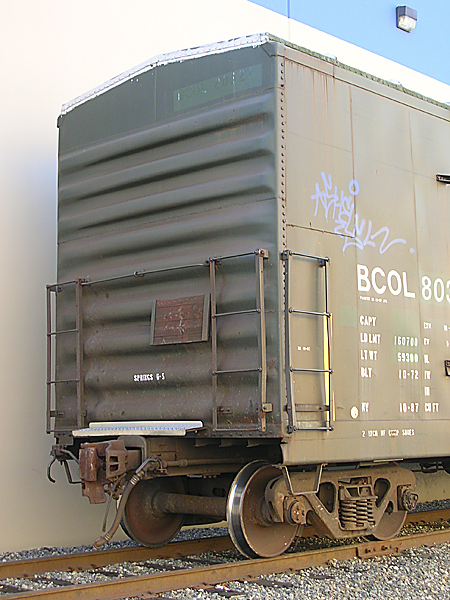 Starting in 1991, BC Rail started shopping the remaining cars and the most notable upgrade were new sliding doors. 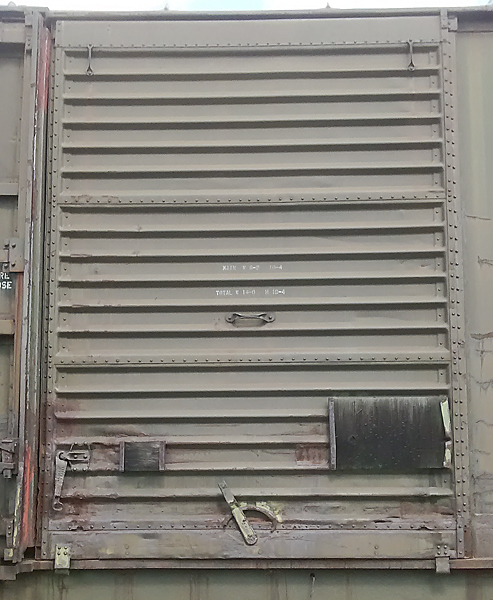 The original YSD 6/6/6 corrugated doors were replaced with YSD panel doors. On the HO plug doors, the left and right hand vertical crank rod pipes and rollers, door handle and crank arms will all be separately applied parts and not cast in place. In N scale, these parts will be cast in place so as to reduce the risk of damage during handling. All three styles of YSD sliding doors, corrugated (with and without fork pockets) AND replacement panel, will be applied to the appropriate cars! The crank arms will be added to plug doors as appropriate, based on time period (HO scale)! The first 800 cars (three orders: 5100-5399, 5000-5099 and 40000-40399) were delivered with large plug door door stops. The following 1,085 cars (4 orders: 5400-5599, 40400-40784, 5600-5799 and 40785-41084) were delivered with small plug door door stops. 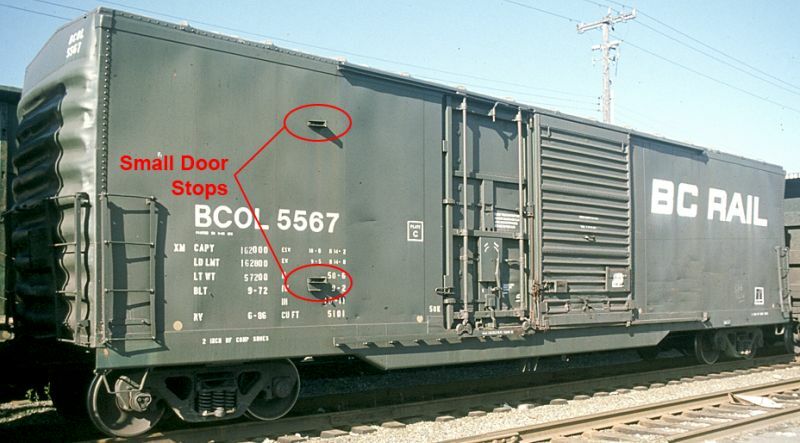 Starting in the mid-1970s, British Columbia Railway started modifying the large plug door door stops. To make them sturdier, a reinforcing angle and gusset were added by BCR shop employees. All three door stops (small, large and large modified) will be available, applied to cars with the appropriate reporting marks and series, as well as the appropriate paint schemes! When the shopping program took place starting in 1991 (and running through 1997), cars were renumbered into the BCOL 80000-80455, 80800-80826 and 80900-80979 series and all were stenciled as having a 5101 cuft capacity. 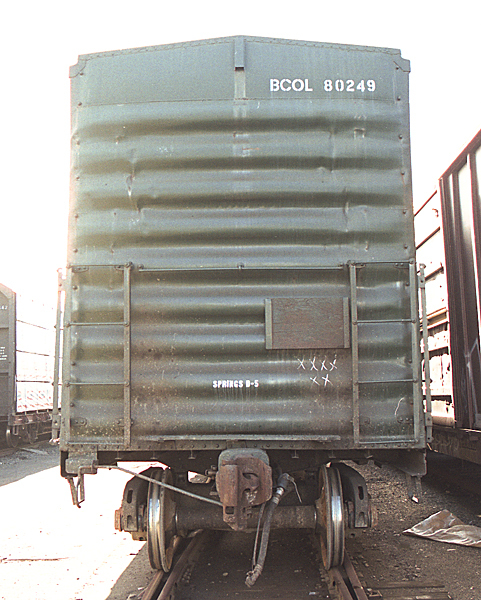 Starting in 1989 (and running through 1997), some shopped cars were upgraded to 100-ton capacity and received modified bolsters and 100-ton trucks. These 100-ton cars were renumbered into the 100000-100012 and 100014-100299 series. Later, some of the 80000 and 100000 series cars were modified again, with vents added to the car sides along the floor line and roof line for baled wood pulp service. Baled wood pulp is often loaded into the cars still hot and wet, so the vent help reduce the moisture level inside the car reducing damage from rust and corrosion. Two styles of vents will be available to be included on appropriate cars, naturally, with the correct reporting marks, series and paint schemes! Newly tooled 70-ton Barber S-2 trucks with free-spinning metal wheels and axles will be applied to the 70-ton cars, and the 100-ton cars will be supplied with North American Railcar’s highly respected 100-ton Barber S-2 trucks with metal wheels and axles. 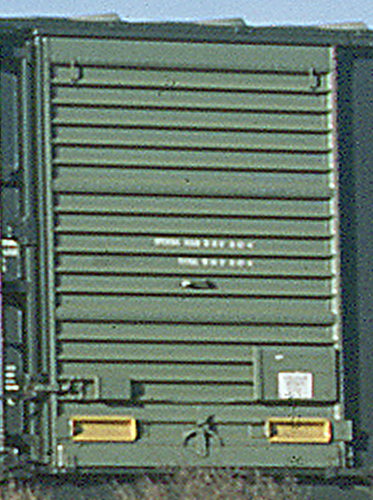 This exciting new model freight car has been extensively researched and has been accurately tooled with a separate roof, one-piece body (car sides, side sills, ends, and floor), separate doors and door details, separate tack boards (HO), separate ladder stiles (HO), wire ladder rungs (HO), separate hand brake and wheel, separate underframe and brake details, etched metal crossover platforms, separate door tracks (HO) and separate large plug door door stops. It’s time to add these superbly detailed cars to your roster so you can ship forest products on your railroad! 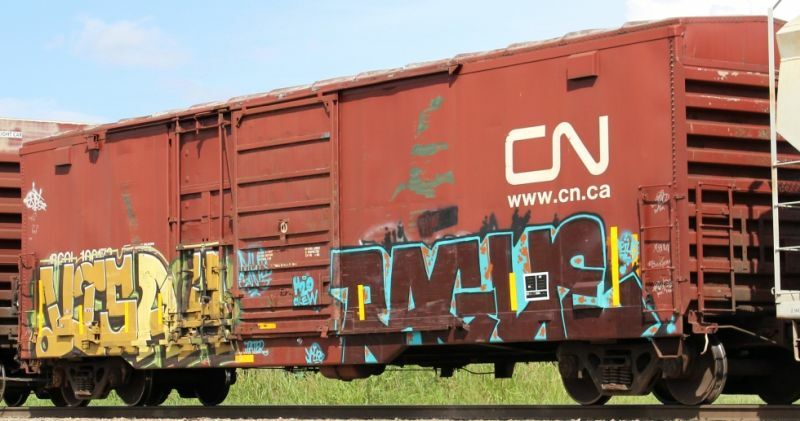 NARCorp will be adding two new Club Lounge cars! As always, these cars are FREE with PORTERS points, and are available exclusively to our PORTERS members on a first earned, first served basis. They are a limited production, and will never be reproduced. PORTERS members: reserve your car in the Club Lounge. If you are not already a PORTERS member, click on the blue box at the bottom of this announcement to discover the advantages of joining this consummer driven program – Available at no cost. The Canada–United States Free Trade Agreement (CUSFTA; French: Accord de libre-échange, ALE) was a trade agreement reached by negotiators for Canada and the United States on October 4, 1987 and signed by the leaders of both countries on January 2, 1988. The agreement phased out a wide range of trade restrictions in stages over a ten-year period, and resulted in a great increase in cross-border trade. With the addition of Mexico in 1994 FTA was superseded by the North American Free Trade Agreement (NAFTA) (French: Accord de libre-échange Nord Américain (ALENA), Spanish: Tratado de Libre Comercio de América del Norte (TLCAN)). Over the years, and with an ever changing cast of characters, this has evolved into the North American Free Trade Agreement (NAFTA; Spanish: Tratado de Libre Comercio de América del Norte, TLCAN; French: Accord de libre-échange nord-américain, ALÉNA). NAFTA is an agreement signed by Canada, Mexico, and the United States, creating a trilateral trade bloc in North America. The agreement came into force on January 1, 1994. It superseded the Canada–United States Free Trade Agreement between the U.S. and Canada. Today: North America and the world are waiting to see what comes next, as Canadian Prime Minister, Justin Trudeau and US President, Donald Trump take on the starring roles. "100 TON PULP SERVICE ONLY"
One-of-a-kind, BCOL 100000 was the 1st rebuilt 100000 series car, and is the only car with "100 TON PULP SERVICE ONLY" on left side. This was removed on the remaining rebuilds. Remember – these 2 cars are only available to our PORTERS members!